Purloined this photo. My excuse? I have a bad cold. This is is no way meant to be a reflection on Ginger's character, but I thought this recipe just went with the spirit of this long President's holiday...or should it be plural...Presidents' holiday? The sin must be in eating it because it’s pretty easy to make, but beware of lots of steps and dirty bowls. with a pastry blender and press into a 9x13 glass pan. Bake at 350° for 25 minutes. Cool. Spread layer one over the cooled pecan crust. Spread ½ whipped cream* over that. Top whipped cream with layer two (vanilla). Then layer three (chocolate). Top with remaining whipped cream. 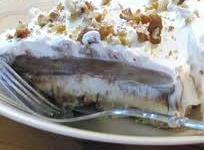 directly over the whipped cream using a micro grater.Sprkle with chopped pecans, if desired. Refrigerate. Ginger is taking advantage of the long weekend to show off her hostess wear. She is busy whipping up a little sin for Tyler...I mean Sin in a Pan...of course.﻿ What a fitting climax to their holiday together.